What happens when one of the biggest media groups in the world sets up its own private security force? What happens when part of this operation goes rogue? News of the World is not the first Murdoch company to be accused of skullduggery. 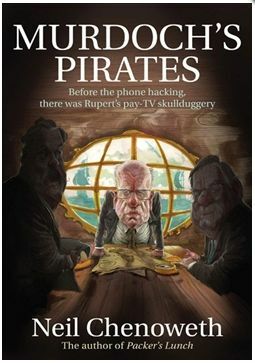 Murdochs Pirates is about the dark deeds of a secret division of News Corp, based in Jerusalem, operating in a combustible world of ambitious ex Scotland Yard men and former French and Israeli secret service agents, who have one thing in common - they have all left their previous employment under controversial circumstances. NDS produces smart cards for use by pay TV operators; this is a fiercely competitive field and one of the ways you get business is to demonstrate that the smart cards produced by your rivals can be easily pirated. Unless you are very careful, sometimes those pirated versions make their way out into the real world, where they can really damage your competitors businesses. Murdochs Pirates reads like a thriller, set in the arcane world of hackers and pirates. There are mysterious deaths, break-ins and wild chases. Some of the individuals involved may well be amongst the brightest minds on the planet, but sometimes their rivalry can get out of hand and their impulsive behaviour can defy logic. Chenoweth recounts this clandestine war with his customary lucidity, drollery and brio.